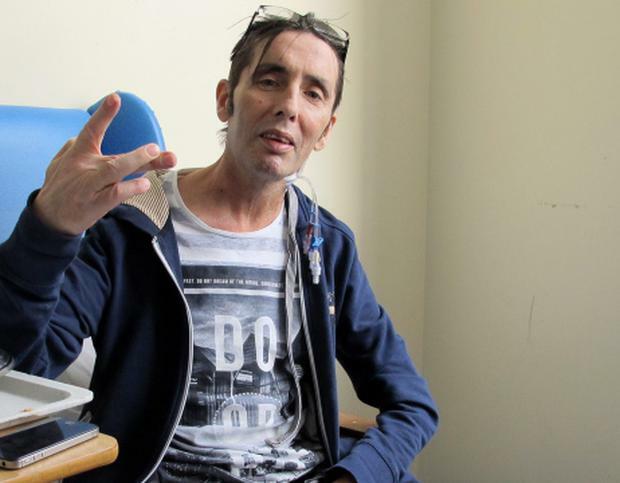 SINGER Christy Dignam has spoken for the first time about his battle with cancer and how close he came to death. In an exclusive interview with the Herald, the Aslan frontman revealed he thought doctors had made a mistake when they told him he had two types of blood cancer. He thought at one stage he had died - but an adreneline shot brought him back. Brave Christy (52) spoke openly about his battle for life following the shock cancer diagnosis – and how his heart had stopped beating at one stage. But the singer remains upbeat and is determined to survive. The Crazy World singer has vowed to give his daughter Kiera (26) away at her wedding in June – even if she has to push him down the aisle in a wheelchair. In his first interview since his cancer diagnosis, Christy revealed how doctors thought he would be dead by now. At one point he woke at 2.30am with panic going on around him. "My heart had slowed down to a stop. I could see the nurses running around in a panic. My fear level went to a point I didn't know existed," he recalled. "I was ready to die, but at the same time I didn't want to die, I wanted to live. I was awake through this telling my heart to keep beating. That I wanted to live." Speaking to the Herald in Beaumont's Intensive Care Unit, the 52-year-old said cancer has been "both the worst and the best thing" that has ever happened to him. "Finally, I know what life is really about – it's not about the music business and selling more records than U2, the most important thing in life is family. "I am a changed man. I know I will never do drugs again," he said, adding: "I absolutely know I can beat this." Dignam was first admitted to James Connolly Hospital in Blanchardstown just over a month ago – but the ailing rock singer was later rushed to Intensive Care at Beaumont Hospital. "I had left it too late. The first doctor who saw me, came back the next day and told me he was surprised that I was still alive." In order to restart Dignam's heart after his near-death experience, doctors injected him with a shot of adrenaline. When that failed to work a second shot was administered. "There was a blockage in my arm where the adrenaline was going in so they had to slit the side of my neck, straight into the jugular and right down into my heart. I felt like I had died for a minute or so, nothing seemed to matter, then suddenly the adrenaline restarted my heart." But worse was to come – a day or so after a series of blood tests, doctors diagnosed that the singer was suffering from not one, but two, blood cancers: Amyloidosis, in which amyloid proteins build up in the body's organs, and Myeloma, a cancer that attacks plasma cells in the bone marrow. Dignam told doctors to "f*** off" when they first broke the news to him about his cancer. "I told them they must have made a mistake. Growing up, I had two fears in life, one was becoming a junkie and the second was getting cancer. "The doctors told me straight that I was so weak, they were keeping me alive in the hope that I would be strong enough to receive chemotherapy. I found out later they had taken my wife Katherine into a family room at the hospital to tell her the news before me." The news had a special poignancy for Dignam as just 12 months earlier he had visited a young cancer sufferer at the same hospital in a nearby ward. "His dad had rung me up and asked me to come in. He was a lovely kid, so the next day I came back with the band and we played him a few songs. The boy later died and I was thinking about what he went through lately, as this was all happening to me." Since news of his cancer was made public, he has received hundreds of messages of support from fans. "One child wrote to me to say I'd visited him in Crumlin Children's' Hospital last year where he'd had 41 operations. He told me 'not to worry' as God had promised him 'Christy wasn't going to die'. I don't believe in God in that sense, but when I read that child's letter, I just broke down and wept." With family now foremost in his mind, the singer has vowed to beat the disease and be around for the wedding of his daughter Kiera to long-term partner Darren Moran in June. "Even if Kiera has to push me down the aisle in a wheelchair, I will make that wedding," he said. Now fitted with a defibulator in his chest, and wired up to monitors, he said he remained a member of his other family – Aslan. "Aslan has been my life. If I couldn't sing with Aslan again, I wouldn't want to get better. We will be back onstage together," he said. Speaking just hours before his third session of chemotherapy, the frontman dodged questions about how he was feeling to praise the nurses and cleaning staff at Beaumont Hospital where he is being treated. "I have been so well looked after by them. The problem that the damage done to my heart and internal organs is already done. They can't reverse that, but hopefully they can slow the cancer down and stop it."